In a move that brings it in line with larger social platforms like Twitter and Facebook, photo portfolio-building platform 500px announced the launch of verified accounts for brands today. Red Bull Media House will be the first brand to participate, and will be able to share it’s wholly-owned photography on the platform. The service currently operates on a freemium model, allowing users to upload 20 images a week for free, or pay for more for premium features, like more storage space and access to the Adobe Creative Cloud for photo editing. 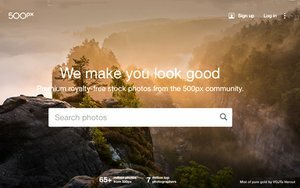 500px also currently runs a licensing marketplace for brands, who can find photographs they like and pay users in order to use those photos in their marketing messaging. 500px CEO Andy Yang says that these crowdsourcing efforts have made the platform somewhat like the Uber for photography. While the service currently caters to the professional/semi-pro caste of photographers, Yang says that social photo-sharing platforms like Instagram (and Snapchat to some degree) have made a lot of iphonographers enthusiastic about photography.